The graph below shows growth in Corrected Money Supply (my version of money supply) from January 2005 to October 2016. From January 2014 it fell continuously and showed every sign of falling below the zero mark. But the plunge stabilised in January 2016 and has been mostly growing steadily since April. In October, the latest for which data can be calculated, the growth rate stood at 7.8%. The reversal looks similar to that which took place in 2013 but that was owing to the Fed's QE. This time there is no QE and in fact the Fed is slowly winding down its balance sheet. 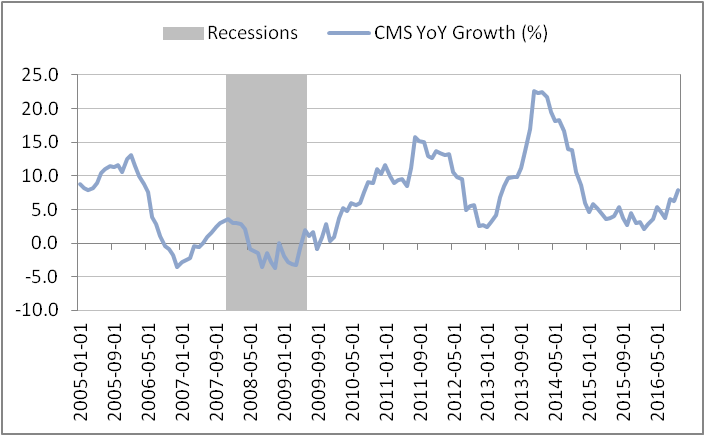 The proper comparison may be with the reversal in growth that took place from the start of 2007 and went on until the recession began. In that episode the growth in money supply may have been because of money exiting the housing market and waiting to be invested in other asset markets. This time too the growth of money supply may be caused by money exiting some asset market (possibly bonds) and being invested elsewhere. Will a crash follow soon?